Bloomberg Media's second-ever presentation at the Digital Content NewFronts today featured a pair of major themes: the publisher's growing video content and how it's leveraging more data to attract advertisers. New York-based Bloomberg revealed that it's now garnering 20 million monthly video views while doubling its video streams in the past year. What's more, its mobile users are up more than 25 percent, Bloomberg says. Eight things—two advertising initiatives and six focusing on content—were unveiled at Bloomberg's NewFronts showcase late this afternoon at its midtown Manhattan headquarters. Kinection is a branded content studio that's, per a Bloomberg statement, "powered by data, rooted in global context, and storytelling across every platform. The studio combines the kinetic energy of our proprietary data and technology with the connective power of our global, multi-platform scale to create custom content that is on par with editorial quality and transparency." Bloomberg's VidPlus program will let marketers buy ads that momentarily pop up within the programming screen during an online video. The promos are powered by native-ad vendor Watchwith, which other media players like Fox have used to run ads during TV shows. Data will help inform the placement, Bloomberg states, "at contextually relevant, precisely targeted moments to enhance the viewing experience." The company is announcing the fall launch of a technology vertical that will accompany other online sections such as Markets, Futures, Europe and Commodities. The technology hub will employ more than 100 global journalists and include a healthy dose of video coverage. "Global business and technology go hand in hand," said Michael Shane, Bloomberg's digital managing editor, speaking at the event. The move is likely designed to boost the publisher's ad dollars from digitally focused startups looking to build their brands among the business-to-business marketing crowd. 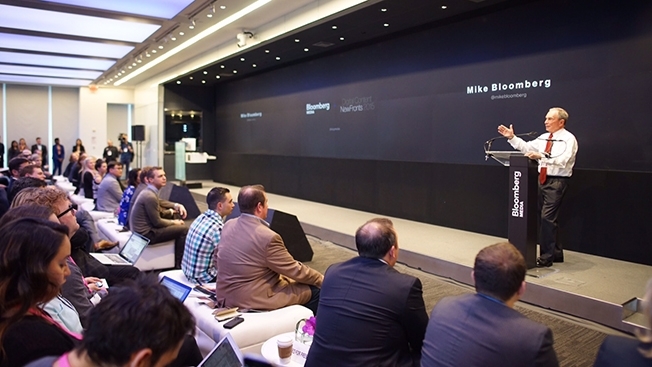 Technology isn't the only area in which Bloomberg is ramping up content. Its new Walk The Talk series will look at the critical importance of women in executive leadership. It will also entail statistics from the publisher's new Gender Equality Index while featuring special contributor Shelley Zalis, founder and CEO of The Girls' Lounge. Working with tech player Illo, Bloomberg will use data to create animated videos in a matter of minutes. The effort, called Rithm, will evidently be employed to tell business stories in a visually fresh way. "This could be a game-changer," said Shane. Bloomberg is teaming up with IMG to zero in on the business stories behind luxury. The series Success by Design aims to build on the publisher's cross-platform luxury department, Bloomberg Pursuits. Philanthropist and financier David Rubenstein will host a show called Peer To Peer, which will attempt, per a Bloomberg statement, "to break the leadership programming mold to uncover rare insider stories from a range of leadership guests." Big Problems. Big Thinkers. is a series that will grapple with the critical issues of the day with guest appearances by Wall Street legend Warren Buffett, director Steven Soderbergh and Bloomberg Media founder Mike Bloomberg. Former news anchor Terre Blair will host the show, which will be sponsored by Cisco.